Hopefully, you haven't ditched them yet. If you still have any Circuit City gift cards left, HHGregg is offering you an opportunity to use those (previously) worthless gift cards. 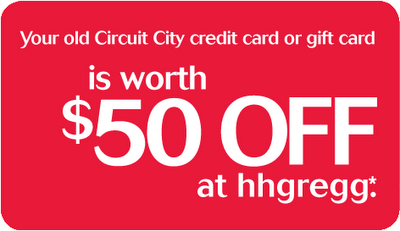 Now thru May 31, 2009, you can use your Circuit City gift card of any value at HHGregg for a $50 credit towards any purchase of $299 and up. The offer is good in-store only and customers will only be able to use one gift card per transaction. This is good info to know. I will pass the word. Thanks!